If I had a dollar for every time my mother said that, I could have retired in luxury. That phrase did not mean that I should wait before having children. It meant that if I did something immature or stupid in the past, my time would come one day and I would have kids of my own and would see them doing exactly the same thing, I once did. I now have once said that very same phrase to my teenaged daughter..."You wait 'till you have kids!!!" Needless to say, giving birth isn't the greatest experience in the world, but it gives women an excuse to say they have a higher pain threshold than men do. When I was in labor, it was only for few hours and it wasn't so God awful, terrible. (Gallstones are ten times worse!) Although, I felt really sorry for another woman who was in the hospital with me. She was in hard labor for 23 hours. I was fortunate. When Ashley was a baby, she was the first grandchild and great grandchild on her father's side, so yes, she was spoiled and was given lots of attention. Since she was born in December, she was given a sleeper set, a rattle, and a Christmas ornament that said, "Baby's First Christmas" on it. Being the typical newborn, she cried a lot, and LOUDLY!!! I had enough, one day, and told her that this was going to be BABY'S LAST CHRISTMAS if she didn't knock it off. Her father didn't care for my sense of humor too much, but her uncle thought it was funny. Even as a baby, before she was a year old, it was like Ashley had her own special personality. She started moving and dancing to the music on the radio and TV. Her favorite performer from ages 1-3 was Paula Abdul. If Paula Abdul was on TV or the radio, Ashley was content and there was peace and quiet for a few minutes. Just think how happy I was when MTV did a two hour long Paula Abdul music special, back in the early 1990's. WOO-HOO!!!! Ashley was a heavy baby from eating a lot, unlike the 7 lb 3 oz newborn, her father and I had brought home from the hospital. She started walking on her own on New Years Day, 1990. Her favorite toy at the time was a stuffed Cookie Monster baby. I missed a lot of months with her "terrible twos", because I was away on active duty. When I got back home, it was like she wasn't a baby anymore, but a kid. She was talking in her own sentences and was learning something new everyday. Ashley learned her colors and letters of the alphabet very young, and started to enjoy playing with other kids she saw. We lived about two miles from the oceanfront, so we went to the beach often. Her father's family had watched her a lot, too, so I cannot say I actually know what it's like raising children 24/7 on my own and more than likely, I never will. When she got a little older, Ashley started to take an interest in what I was doing. She always wanted to go to school with me, or the Reserve Unit where I worked. She wanted to watch MTV all the time, as well as Nickelodeon. And she picked up stuff from TV too. It was common back then, seeing her run around the house saying, "Happy, Happy, Happy, Joy, Joy, Joy!" from "The Ren and Stimpy Show". I knew then, that cartoons were not a bad influence, but watching the news and "Unsolved Mysteries" were. It was like; I lived in total fear, because I was always hearing about some abduction. This made my child scared too and she never left my side, in public. When she started school, she was popular around the other children. She then became picky about clothes, at a young age, which I understood. I had a child's school record book I wanted her to fill out one day, after school. All she had to do was print her name in her own handwriting. Well, she started to write her name and accidentally spelled it wrong, adding another "s" after the first "s". She wasn't paying attention and made an error. Ashley stopped, looked at me, and said, "I messed it up". And she still remembers the incident and brings it up to this very day. It was a funny memory for her and she never forgot about it. 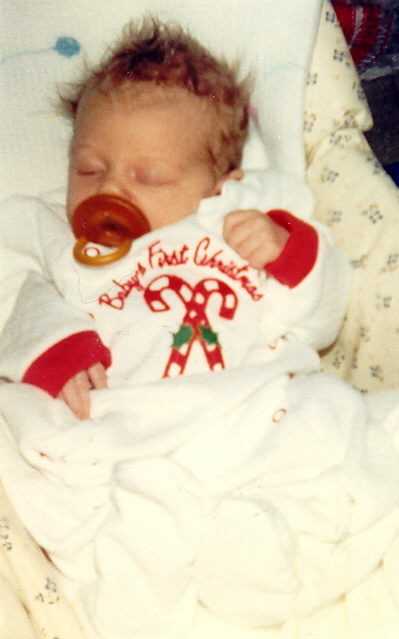 My only child, Ashley was born Dec 5, 1988 at 2323 hrs at Portsmouth, Virginia. She weighed 7 lbs 3 oz. Ashley is now in the ninth grade. She acts in plays at her school. Her acting abilities totally put mine to shame, but that's okay. She also helps baby-sit children part time for another family. In the summer of 2002, we went to Disney World and even though things are different now than when she was little, we still get the chance to go places and spend time together.